Assassin's Creed III was, for me, an agonising paradox. It's both one of the best games of last year and also one of the most frustrating, one where a strong foundation of combat and exploration was undone by poor pacing and mission design. You'd hope, then, that new singleplayer content for the game—released months after the main game's slightly divisive reception—would be a chance for Ubisoft to experiment a little. In some ways, it is, but in others...this is still Assassin's Creed III, folks. 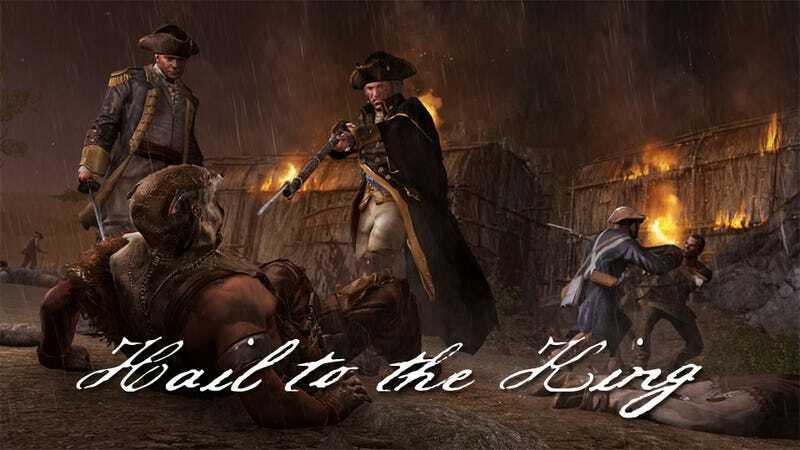 The Infamy is the first of three planned chapters in The Tyranny of George Washington, downloadable content for Assassin's Creed III that takes the form of a new singleplayer "campaign" of sorts. The game's premise is a unique one, at least for a series that normally takes its history a little more seriously, in that our hero finds himself in a comic-book like alternate reality, one where he never joined the Assassins, never saw his mother die and never hung out with the key players of the American Revolution. Instead, George Washington is now King, and in keeping with the comic-book tone, is a very bad man. Because this campaign—or at least this first chapter—plays out from a Native American perspective, the scope of things has been narrowed extensively. Instead of giving you the entire world to play with, each chapter will only focus on a single game area. Later episodes will deal with the cities, but this one takes place entirely on the Frontier. So, fresh start, smaller playground, it's a chance to fix some stuff, right? Not really. My main issue with Assassin's Creed III, and it's the reason it tears at my heart, is that it marries the joyous with the controller-snapping, often within seconds of each other. Great combat undone by haphazard and overly-strict mission design. A gorgeous, enormous world that's surprisingly empty. Fascinating people that you see through the lens of a lifeless main character. Infamy doesn't change that. There's a mission early on where you need to flee a burning town. It's a stunning setting, the night sky twirling with embers, the buildings ablaze, the map littered with countless soldiers and NPCs engaged in a fight for their lives. You are right there, in that heavy, wordly way Assassin's Creed does so well. It's amazing. "Jump on a horse," you mother says. OK. You jump on a horse, ride 20 feet alongside her, only to hear her shout in frustration "hurry, get on a horse." If you're lucky, you'll even sometimes get a "mission about to end" warning pulse unless you ride around in circles a few times. Well. There goes that immersion. The first chapter of this DLC is full of moments like that, where your experience is broken not by an outright, game-crashing bug or a fundamental failure of player awareness, but by little things. Inconsistent soldier AI on a stealth mission. A level spent chasing wolves on a drug trip which you'll play multiple times whether you want to or not. I just found myself constantly beating my head against a wall, wondering how can we be given so many amazing tools as players and then have them put to the test in the most frustrating ways? On the bright side, the chapter's limited scope means some of the changes—perhaps made because the focus here is almost wholly on a short string of singleplayer missions—made to the game are for the better. If you got tired of trudging around the frontier on your way to mission markers, you'll be happy to know the markers themselves are now fast-travel points, especially since this entire chapter takes place with snow on the ground. You might also love, like I did, your new "Ghost Dog" powers. Because in this DLC Connor isn't Connor, he's only Ratonhnhaké:ton, you get to do what the main game never allowed: run around as an adult Native American. Part of this involves drinking a special tea, which grants you two combat powers. The first directly replaces the "send in the Assassins" button, and unleashes three "spirit" wolves on your enemies. The second is much more radical. It's a cloak, and the easiest comparison to make would be the invisibility powers from a game like Crysis, or Deus Ex. Turn it on and you become, to everything but dogs, invisible, the only catch being that it drains your health. It sounds game-breaking, and in truth it comes very close to doing just that, but the freedom it offers in engaging in stealth is worth it. The worst part of any Assassin's Creed game has always been forced-stealth missions. They've been something to dread. This cloak flips that on its head, empowering the player and turning the chapter's sole actual assassination mission into its highlight. While the same frustrations I've had with the main game carry over, I'm still keen to see where this DLC takes us. With new powers, a bizarre storyline and two remaining chapters that are centred on urban areas, I'm even hoping—perhaps foolishly—that a tighter focus can bring back a little of the old Assassin's Creed magic that was missing from much of Assassin's Creed III.